Everest 2019: Before the First Steps into the Icefall Everest 2019: Climbing!! Both sides of Everest are buzzing with activity. In Nepal they are training, and a few have actually climbed through the Icefall to Camp 1. On the Tibet side, there is a building boom with team after team putting their array of tents. Looks like the good people running EverestLink are aware and have addressed slow WiFi speed at EBC. Their General Manager told me “It was slow for 2 days prior to yesterday, caused by some malfunctioning at a power station. It has been corrected now.” However, I’m still seeing reports as of slow speeds so I’m not sure they really got it fixed. It looks like there are 364 total people on the Tibet side made up of 144 foreigners, 12 Chinese and 208 Nepalese Sherpa. An additional 73 are reported to be visiting or working at base camp. source For reference, there are around 725 on the Nepal side. Big snow and winds forecasted for Nepal side on Wednesday and Thursday. The large Annapurna team climbing Annapurna by the normal route and supported by Seven Summits Treks, are holding for the next weather window expected around April 23/24. The fixed ropes are now at Camp 3. One more item in the “other” column. 80 year-old Carlos Soria has announced he will postpone his 10th attempt on Dhaulagiri to the autumn of 2019. He has Dhaulagiri and Shishapangma left to finish all fourteen 8000ers. He started after he turned 60. Some news from the Icefall, as the first members (i.e. not a Sherpa) went above the Icefall. Myself and one other climber from my team went to Camp1 this morning. Beautiful morning weather. Didn’t see any other westerners, but A lot of sherpa from a lot of teams dropping stuff at C1 and C2. Ice fall has 2 single horizontal ladders, and about 5 or so vertical ladders (singles and doubles). Tim Mosedale, veteran Everest guide, made a sortie in to the Icefall and has a nice write up of his observations. Overall he notes that while it’s pretty direct, it has several steep sections that will slow people up and down. The suggests that smart teams will start very early, perhaps no later than 2:00 am. A snippet of his comments and one picture. Read his full impression on his Facebook feed. The route this year is pretty good in terms of lack of objective danger. But, and it’s a bit of a big but, there are quite a few sections where you can tell that less well versed folk are going to start jumaring and cause tailbacks. Richard Cost has another dramatic picture. They are training near EBC. Looks like he was using a jumar to go up. He is with Madison Mountaineering. Another training image. This time of Kristie Ennis climbing with Myrmidon Expeditions practicing crossing a ladder with her prosthetic leg. We are getting our first pictures of Chinese Base Camp aka CBC on the Tibet side of Everest. This camp is about as different as night and day from the Nepal side. It’s a huge expanse of dirt. While dusty and windy, its so large that it allows teams to really spread out as compared to the cramped camps at the base of the Khumbu Icefall. And it has the best view of Everest on the planet. Jason Baldy climbing with Furtenbach sent me a few pictures as they arrived at CBC. Well arrived at Everest Base Camp (Tibet) 5200m Yesterday after a very long drive from Kathmandu, and a few smaller acclimatisation hikes in Tingri. Today We had excellent views of Everest and will go down to visit the Mallory memorial later today. Tomorrow We will have our Puja (ceremony for blessing our equipment). 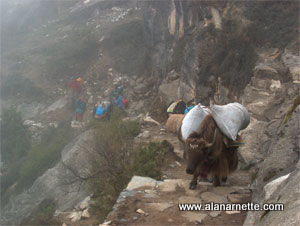 And then We will head off for Advanced Base Camp before we start to do our rotations up and down the mountain. So happy to be here surounded by great people. Our first view of the mountain for the season, and it looked like a classic summit day…in mid-April! No wind plume, and loads of snow plastering the face. It’s amazing to arrive in Base Camp, and I literally cannot sit still with excitement to go higher. Soon.. Your first trip is tomorrow but you begin to process the experience today. You know the drill going up the Icefall for the first time based on your trip to the Football field yesterday. But all of a sudden you envy those on the Tibet side as their first trip from base camp is a long boring hike to the Intermediate Camp – no snow, seracs or glaciers. For you, the schedule is now routine at EBC, get up early, eat something. That means someone with really bad menu skills and thinks breakfast is a check off item and not nutrition. You try to get it down. You gulp the tepid Nescafe and eat half a piece of toast. Honestly, the jam you spread on it was the best part. In the future you will just eat jam and no bread!! Outside, you and your other teammates pull into place. Your Personal Sherpa comes over and gives you an inspection. He ask to “feel” your pack. Oooh heavy? He, without asking, starts taking things out. You stand there, like a child, taking his direction and action without protest. A few days ago, you did protest but now it becomes clear that this Sherpa knows more than you and has your best interest at heart. You decide the best option is capitulation and relax. Today, you realize that this group of Sherpas are there for your safety. You begin to realize that not all Sherpas have the same skills , training and experience. However this group have seen this rodeo before. You are glad you spent the extra money so that the Sherpas are paid more and you have the best. It’s becoming more clear, that climbing Everest is not a simple “put one foot in front of the other.” Or the cliche that you pay $65,000 and get short-roped to the top. Climbing Everest is complex. It requires everyone to work together from cooks to Sherpas to members. You now understand that your role is to take care of yourself to be strong and healthy, part of the team and personally responsible.